Once the splices on the panels had firmly set I gave the panels a quick sanding to rough up the epoxy coated surface. The fibreglass splices are incredibly strong and able to take the manhandling they were given as the panels were placed into the basket mold. With some assistance I first placed the bottom panel in the basket and then added the side chine panels. A few strategically placed cable ties helped to hold the panels together. As I was shifting the panels about to get them properly seated in the basket it became obvious that I’d need to add some vertical support at the bow frame of the basket. 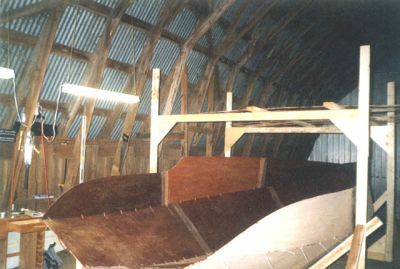 Once those were added the hull began to take shape. It was an awesome feeling to see things coming together after just a few days of work. When I was happy with the alignment of the bottom and chine panels I added a bunch more cable ties to hold everything together. I bought the lumber to construct the basket mold at a discount “seconds” lumber yard and picked up a few packages of cable ties there as well. The wood was actually decent quality for a fraction of the price – a few more knots and a couple of hockey stick 2×4’s. The cable ties were a different matter. The ridges on the “zippers” were too small and would give under pressure. A little bit of economy turned into more fiddling work than it should’ve been. I only recognized the problem after the entire hull was stitched and had to go along and replace each tie one by one. Next to go on were the topside panels. They snuggled into position quite nicely and once they were stitched to the chine panels I could stand back and truly see just what it was I was building. The confidence I felt from this was significant. That certainly is one of the benefits to this building method for the amateur boatbuilder. Very early in the process you get a good idea of the final product as well as that feedback that you are doing things correctly.